Visit the civil war and medieval army encampments. Meet and chat with the off-duty soldiers, and have a go at archery yourself. The Living History camp will remain open throughout the day. 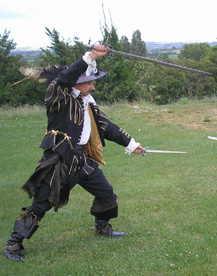 An introduction to the drums, colours and fighting arms of an English Civil War army. A court leet was used to settle local civil disputes, chaired by the gentry. Visitors can take part in this interactive display, voting to help decide the outcome of the case. See the lavish feasts and wide range of dishes enjoyed by the wealthy 17th century nobility. The legendary English longbowmen display their skill-at-arms. Hundreds of English Civil War soldiers fight with pike, musket and cannon. Chaos, colour, noise, and smoke. An opportunity for children of all ages (and adults) to have a go at being a Civil War pikeman and chat with the soldiers after the battle.